Corporal Frances Tabisa says her strong family upbringing, spiritual belief and stern military background allowed her to overcome difficulties and challenges she faced in Baghdad, Irad in the past year. 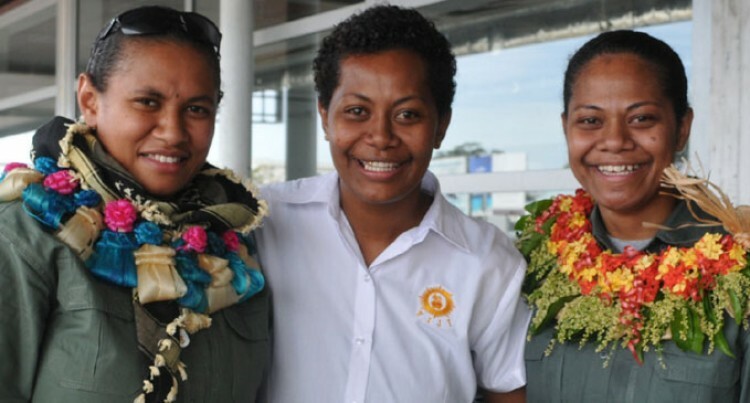 Corporal Tabisa originally from Nacobo, Ovalau, also beat her family’s record in the duration of tour of duties shared among family members – her father, brother and sister are all soldiers. Corporal Tabisa was part of the group of soldiers who returned home from Baghdad yesterday at the Nadi international Airport. They were part of a rotation, with more troops joining those serving in the United Nations Guard Force. “I treated that place like my home. Everyday was like a battle. We faced difficulties, but we managed to overcome all those through God. Without Him, we wouldn’t be here,” she said. She said she was based at the UN Headquarters in Baghdad. “I was based at Biap in 2013 for six months and then I moved to the headquarters where my best friend Unaisi Tuinatewa was. I was definitely happy about that,” she said. She said her arrival would be planned as a surprise to her other siblings and also her mother. Her sister Private Ettah Tabisa who was at the airport, said she was proud of her sister. “I’m so proud of my sister because I had served in Iraq for only six months and she has served for one year and six months. My father and brother are in the military as well,” she said. Corporal Frances is based in the territorial forces while Private Ettah is part of the 3FIR (Third Battallion Fiji Infantry Regiment). “This will be a surprise for our mum because she is sickly and she was hoping to see my sister before anything would happen to her. I’m really happy she’s back,” Private Ettah said.